unkx80: has to connect at a.
Orcun: I can not agree, at a and at 1 is not so good. AE (Andre Engels): I don't agree with Orcun. 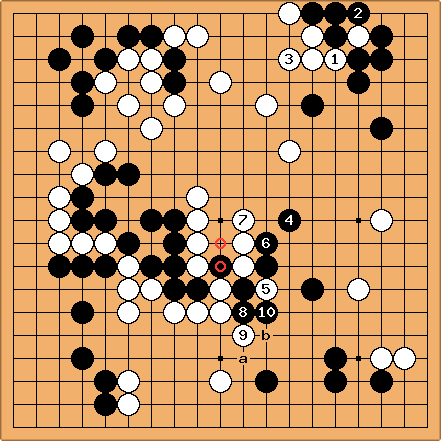 After at a, at 1, at 2 completely destroys the shape of the black stones. A black move at 1 is not extremely big. An alternative to connecting at a would be destroying black's shape at . AE: : It would be good for black to play atari at a first - cutting in sente. : Orcun: I could connect by 9 but my left group was very weak. So I came up with this move which I believe both strengthens the left group and connect with two alternative ways. One is as it occurred, the other one is a bit complicated with at 9, which I believe is the correct move for black. : Orcun: I tend to like this kind of moves. In the early days ( two weeks ago :) ) I used to refuse to consider my moves as mistakes and try to rescue all of my stones. This move brought me the sente which I know is a lot more important than 2 points. unkx80: Actually, after , the white stone is already captured and cannot be rescued. But for the current situation, and is way too small. : Orcun: I could have connected but at a seemed BIG. AE: a is probably better than , not leaving any weakness behind. 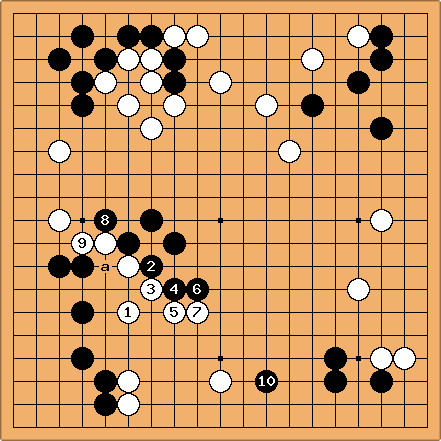 : AE: This is bad for black, she is just helping white connect. AE: is a very strange move. Better just take a large endgame move, for example at a. Locally, b seems to be best. : AE: Not good. Everything in this part of the board lives, so this stone is not important. unkx80: is a good move. AE: I don't agree. Again, the stone that is saved by that move is not important. And if black chooses to save it, 5 is better. : unkx80: If is played at , black gets nothing. Orcun: If at 8 and at 7, then the center is in danger, over-concentration near the after at the circle, and black has possibilities like a and b for the future. Still, arguable though. at b may be a better option. AE: After at 8, white has no need to answer a black move at 7, and certainly not at the circled point. Note that capturing at 8 gives a liberty! As for over-concentration, white is just as overconcentrated now. Orcun: You are right, I have totally mistaken there. : Orcun: Worked a lot for white because of and in the following diagram. - : Orcun: Useless attack. I was expecting a possible disconnector near a. This may have caused the weaknesses that brought the end of black. Is my response correct? I would not question if the bottom side was secure. AE: And it seems black has lost more than she won with this sequence. Before she played here, there were more possibilities. Orcun: I am always late for these kind of moves. I should pay more attention to this. Can this move be the starting move of themacroendgame? unkx80: Yes, is so big that it makes an invasion at b possible. I could almost say that is sente. Orcun: You can be right. I can not find a good response to b. This was something I completely missed, Thank you very much.